FB: GP will make £100,000 in subsidy guarantees available to underwrite 100 Fightback fundraising shows at Grassroots Music Venues promoted by the next generation of young, female, independent promoters. MVT will supply a toolkit and contacts young women need to put on their show. Alongside this, the FB: GP scheme will match them with music industry experts with experience of every aspect of delivering a successful event who can mentor them through the process. Founded in 2017 by music fans first and foremost, Music Planet Live is revitalising the live music scene from grassroots upwards by creating opportunities for artists, connecting venues and promoters with relevant artists and building music communities. 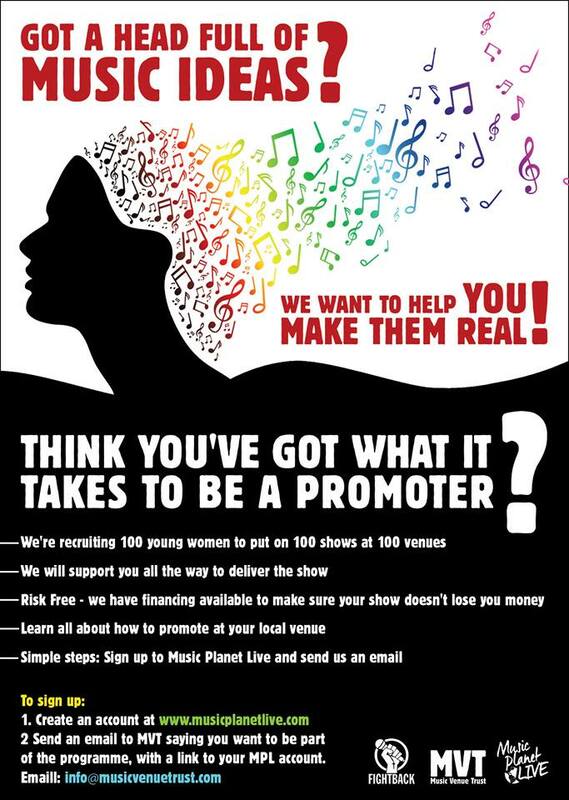 To apply to be part of Fightback Grassroots Promoter, head over to www.musicplanetlive.com and create an account. Then email Music Venue Trust at [email protected] to receive full details on how to bring your show together. Fightback Grassroots Promoter is supported by key organisations and figures from every level of the music industry. Hi there, I’m wondering if this is only applicable to UK residents? Or can young promoters from the Rep of Ireland apply also? Thanks, Madison! Hope you give it a go and enjoy!